Your Personal Audio System needs to be connected to an active Internet (network) connection, either via Wi-Fi, using the SONY | Music Center (SongPal) app on your smartphone, or directly to your active Internet source with a LAN cable. Do not operate, turn off, or disconnect the Personal Audio System from the AC power outlet until after the update is complete. Failure to follow the instructions, or an interruption in the update process, may cause the Personal Audio System to become unresponsive or to require repair. 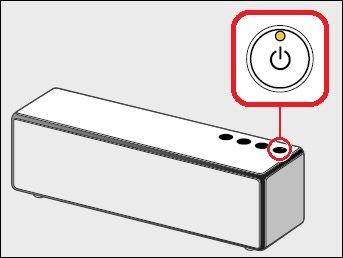 Ensure that the power cord (supplied) is securely connected to the DC IN 19.5V jack of the Personal Audio System, and plugged securely into a wall outlet. Press the Power/-PAIRING button to turn on the Personal Audio System. 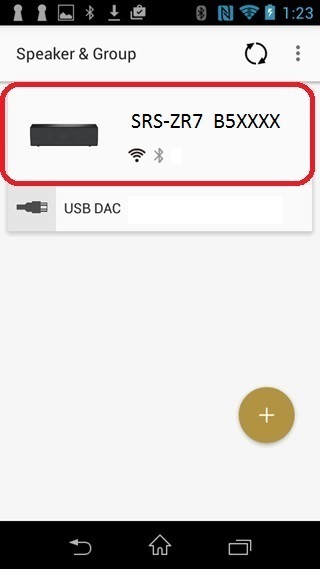 Connect the Personal Audio System via WiFi to the same network as the smartphone containing the SONY | Music Center (SongPal) application. On the smartphone, launch the SONY | Music Center (SongPal) application. At the Music Center screen, tap to select the SRS-ZR7 xxxxxx device. At the next screen, tap to select Settings. 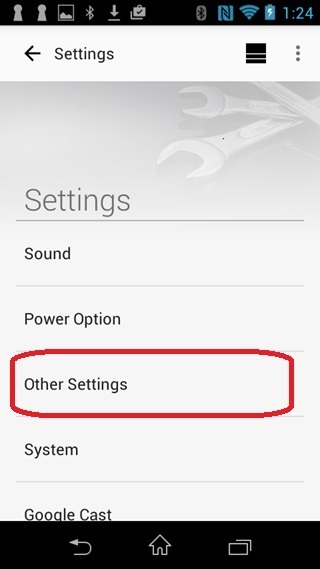 At the Settings screen, tap to select Other Settings. 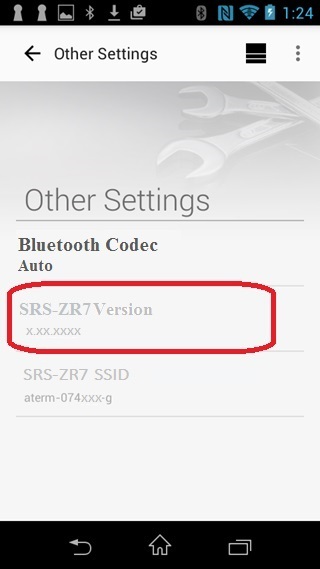 At the Other Settings screen, under SRS-ZR7 Version the current firmware version number will be displayed. If the Firmware version number is 5.03 or higher, this software update is already installed. The Update via Internet Method is straightforward and the easiest way to update your Personal Audio System. If the Personal Audio System is on, press the Power/-PAIRING button to turn it off. 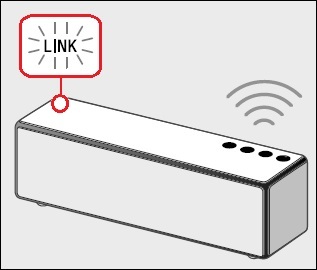 Note: The network update process requires the Personal Audio System to be connected securely into a working wall outlet. 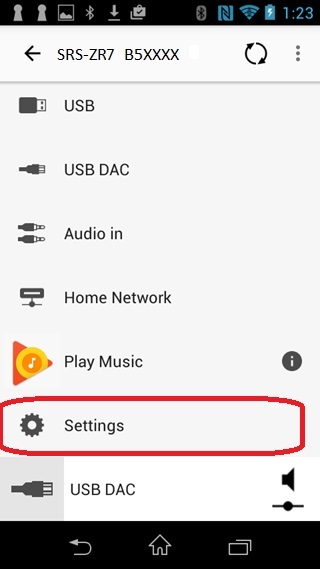 Connect the Personal Audio System to an active Internet (network) connection, either via Wi-Fi, using the SONY | Music Center (SongPal) app on your smartphone, or directly to your active Internet source with a LAN cable. Note: A wired and wireless connection cannot be used at the same time. Note: When a software update is available, the UPDATE/WPS button lights up. Press and hold the UPDATE/WPS button until beeps are heard. When the latest software update starts, the UPDATE/WPS button flashes. Note: The Personal Audio System is not operational while the system is updating. The blinking interval and status of the UPDATE/WPS button changes according to the update progress. The UPDATE/WPS button automatically turns off and the Personal Audio System switches to standby or BLUETOOTH/Network standby mode after the update is complete. Note: If the version number is 5.03, the software update was successful. Q: After attempting the Network Update, all of the function lights are lit up. The software update failed. Perform the following procedure. Press the Power/-PAIRING button to turn off the Personal Audio System and then back on again. Make sure that the Personal Audio System is correctly connected to the Internet and that the UPDATE/WPS button is lit, and then follow the Update via Internet Instructions again. Q: I have performed the Update via Internet procedure again but all of the function lights are still lit up. 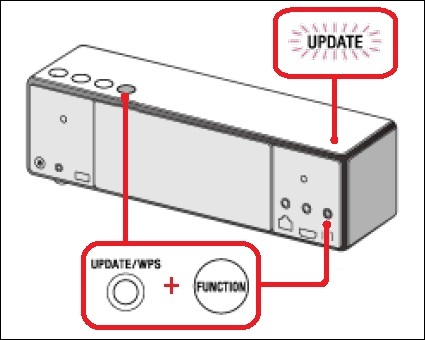 If the UPDATE/WPS button button is lit but the Personal Audio System operates normally, turn the Personal Audio System off, Download and Transfer the Update, and then install the update using the Update via USB Storage Device Instructions. If the Power/-PAIRING button flashes red, the UPDATE/WPS button flashes orange, and the Personal Audio System does NOT operate normally, install the update using the Special Instructions for a USB Storage Device Update After Network Update Failure. With this method, you use a computer to download the firmware upgrade to USB storage device, and then install it from the USB storage device onto your Personal Audio System. You'll need a USB storage device with 256MB space available. Download the SRS16002.UPG file to a temporary or download directory and make note of this directory for reference. Go to the directory where the file was downloaded and verify that the size of the SRS16002.UPG file is 139,788,480 bytes. Right-click the SRS16002.UPG file, and click Properties. On the SRS16002.UPG Properties screen, verify that the size listed is 143 MB (139,788,480 bytes). Note: The Size on disk listed may be different. That is normal. If the file size is different than the 139,788,480 bytes, please download the SRS16002.UPG file again. Copy the SRS16002.UPG file to the root directory of the USB flash drive. For Microsoft® Windows® operating systems: Right-click the SRS16002.UPG file, from the menu click Send To..., and then click the drive (for example: Removable Disk E:) that represents your USB storage device. The folder will be copied onto the root of your USB storage device. For Apple® Mac OS X® operating systems: Drag and drop the SRS16002.UPG file to the root directory of the USB device. After copying the SRS16002.UPG file, remove the USB device from your computer and continue to the next section. The firmware upgrade process usually takes about 10 minutes to complete. Do not remove the USB storage device until the update process is complete. Ensure the AC adaptor (supplied) is connected to the DC IN 19.5V jack of the Personal Audio System, and plug the AC power cord securely into an AC outlet. Once the Power/-PAIRING button light is on, insert the USB storage device into the USB slot on the rear of the Personal Audio System. Press and hold the UPDATE/WPS and FUNCTION buttons for at least 4 seconds until beeps are heard. After the beeps are heard, the UPDATE/WPS button lights up. Note: If you are connected to the network, the UPDATE button may already be lit in orange. When the latest software update starts, the UPDATE/WPS button flashes. Note: The UPDATE/WPS button will flash four times at first, will decrease by one flash at a time as the update progresses, and will turn off completely once the update is complete. Note: The UPDATE/WPS indicator will flash three times the first time you turn on the Personal Audio System after the update.